How is ArtsyStock different from an online art printer? We license digital copies of artists' work, rather than shipping art prints. You can get a print, but more on that in the next question. I want a fine art print of one of your pieces. How do I get one? Each license you buy (i.e. image you download) can be used to make a print for personal use, which includes a framed fine art print for your home, for example. If you want us to print it for you, just click the “Get a canvas print of this art” button when viewing a piece. We recommend buying an image with dimensions no smaller than what you'll be printing. In other words, if you want a 18" x 24" canvas print, make sure the file you buy covers that area at 300 DPI. 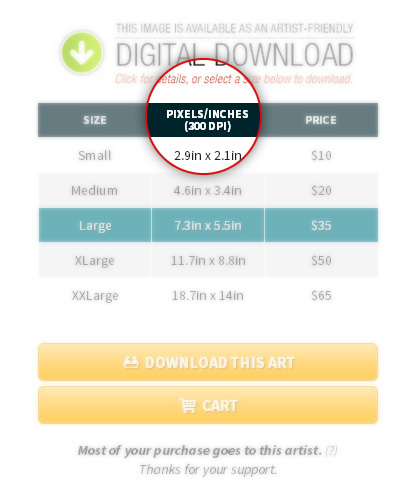 We have an easy way for you to check: Just click the Pixels/Inches selection when viewing any piece of art on the site, as shown below. After you purchase and download the art from ArtsyStock, you can choose from any number of online printers. You can also use your home printer, if you're satisfied with the quality. In this way you have freedom in who you choose so that you can receive the best print possible. Because customers are given an un-watermarked copy of our digital art files, we can't accept returns, since we can't guarantee the file has been destroyed. How can I use my purchased art? Our art downloads are licensed much like a traditional royalty free stock photo. You can use your purchases in your designs, in a print (for personal use), as a background for your device, and more. Please see the full image license below. THIS END USER LICENSE AGREEMENT (EULA) is made by and between Foundmyself ("Licensee") doing business as www.artsystock.com and Customer ("Customer"). "Content" – Stock art ("images") provided to Customer by Licensee. "Artist" – The individual or company who owns the copyright on a specific licensed image. Licensee and/or original artists shall retain all copyrights to Content provided Customer including copyrights to derivative works. Licensee has the rights to issue licensee to Content for a fee to Customer. Customer does not acquire any ownership rights to the Content or the Content after modification into a derivative work. (a)	Digital use of Content requires a URL hyperlink to the Licensee's URL (www.artsystock.com) in the usage credits. Examples include, but are not limited to, Content used in a web site, multimedia CD-ROM, DVD or software product. (d)	Single art print use for décor. The parties represent and warrant that, on the date of image purchase, they are authorized to enter into this Agreement in its entirety, and duly bind their respective principals by their act of purchasing. ', 'THIS END USER LICENSE AGREEMENT (EULA) is made by and between Foundmyself ("Licensee") doing business as www.artsystock.com and Customer ("Customer"). If you notice Foundmyself being mentioned on the site, or on your receipt, you're just seeing the name of our parent company. All art is uploaded to, and available on, Foundmyself, and then mirrored here. ArtsyStock was set up as a more focused platform for our art stock images, since Foundmyself functions as an art community with many diverse features. The prices of art stock on Foundmyself and ArtsyStock, and the license terms, quality and everything else related to the downloads are the same. In what format are your art downloads? Our images are available as high resolution JPEG files in sRGB color space. The DPI might not be consistent across files, but your download will be at the pixel resolution we state on the site. DPI is important when printing, and you can adjust your file's DPI without any loss in quality.